Setting the bar is just how Schnitzer rolls. 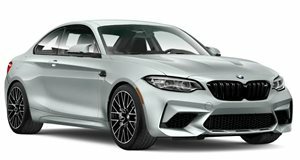 While the BMW M2's factory power rating of 370 hp is more than adequate for the job at hand, that of being a fast streetcar with enough uprated goodies on board to double as a weekend track toy, there are those out there that want more. Plenty tuners have had a hand at making them better in recent months, but many enthusiasts have been patiently waiting to see AC Schnitzer's interpretation. With a reputation for being one of the best BMW tuners out there, the wait was worth it. That 370 hp is now old news, 420 hp is where it's at. There's definitely more power to be extracted from the car, but 420 horses is where AC Schnitzer is comfortable enough to afford owners of upgraded cars a 37,000 mile warranty. The tuner prefers to increase torque over power, and the 427 lb-ft on tap only drops the 0-60 from 4.3 seconds to 4.1, but not everyone likes to launch a car to try and beat the clock. Instead the torque increase is best demonstrated in the 50 mph - 112 mph (80 km/h - 180 km/h) shunt. The stock car manages the pull in 9.8 seconds while the AC Schnitzer car drops that to 8.2 seconds. Mods include a replacement charge cooler, an exhaust system and a fine-tune of the ECU. Power is nothing without control they say, so Schnitzer added a set of fully adjustable RS coilovers. The car is lightened by adding carbon front side wings and aero is improved with a GT-style rear wing, diffuser and splitters - all in carbon fiber.There are a few different wheels on offer to suits differing tastes, they come in 19- or 20-inches with a few different finishes. The interior sees a few changes too with the usual AC Schnitzer pedal set, foot rest, key holder, handbrake lever, a drive control cover and branded floor mats. It's a total package as you'd expect from the German tuner. An M2 that's been through the AC Schnitzer treatment is as close to perfection as the M2 can possibly get.